It started with a series of e-mail exchanges. The first one, from the Producer, asking if we’d be interested in talking with her (and could I answer a few questions). I immediately replied something to the effect of “darn, we already found our place and have been living here for over 2 months….” I should have listened to the little voice in my gut when she responded with neither surprise nor a drop in interest level, but even I got caught up in the excitement of possibly “starring” in a tv episode (gasp!). AND….I started google-ing. Instead of re-hashing what I found, you can check out the blog post here and follow the links to the stories in the newspapers, etc. In a nutshell (and I have no idea why we believed otherwise) the show purposely picks folks who have already chosen their new homes for production sake and then films another 2 options which may or may not have been real options to begin with (and in at least one case were friends’ houses not even for sale). Now we don’t think that anyone believes reality t.v. is REALITY, but I guess I thought that that shows like HHI are more real than they appear (now I feel really stupid, but I guess if a semi-intelligent person like me even fell for it…). We had a long talk about the pros (possible exposure for me to potential employers/opportunities here), and the cons (being disingenuous on national t.v.) and we just could not get over the con (though others feel differently). Even if no one else believes HHI is “true,” we just wouldn’t feel right going along with the ruse. So, I am planning on e-mailing the producer back and am trying to come up with the right thing to say to our realtor (who is lovely and would be perfect for t.v.). *Update – the Producer was very nice about our decision and she IS interested in our realtor and e-mailed her about possibly working together, so “YAY” all around! Nooooooo!! While I admire your sense of integrity–and have come to expect nothing less–I am crestfallen at your decision not to participate in “the con!” It would have been so cool! I’ve watched an episode or ten of HHI and while some of the interplay between the principals seemed hokey and scripted, I don’t mind that it’s “fake” (and no, I did not realize the extent of the trickery involved until I read your post! )…it’s entertaining and it would have been VERY entertaining to see you and Steve on the show! LOL, H & I caught a HHI marathon a couple weekends back and noticed the conversations seemed ‘scripted’ (not to mention the realtor’s choice of apt/houses) in a particular episode and how amazing it was that everyone he ran into spoke English (this guy was Chinese, moving from China to Germany). BTW, while I can understand the thought behind your decision it would have been really cool to see you both on t.v.!! Would love to see the smart-aleky version of the reenactment! Geez, now I feel more silly for NOT doing it We are thinking about launching a youtube show called something like “The Puppetinos show you around Italy”…. 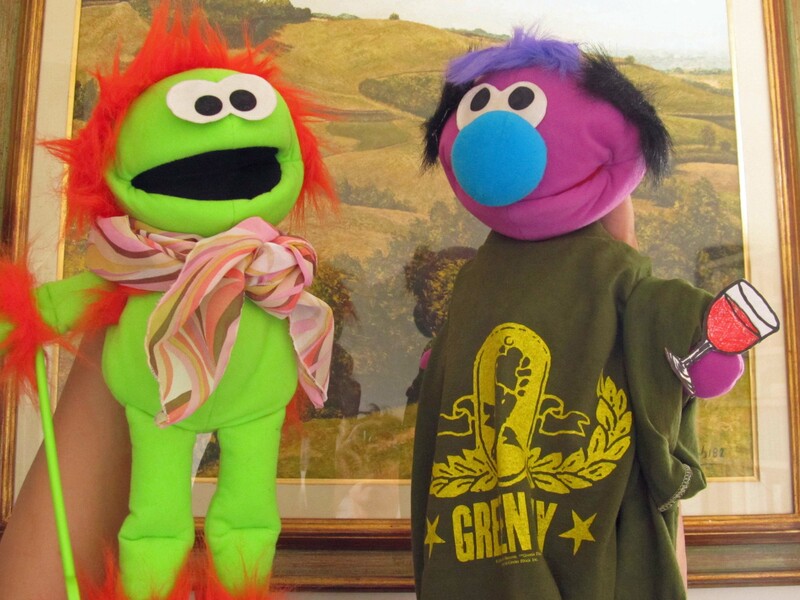 LOVE the scarf on your puppet…. You can always do the show “Living Abroad” on HGTV. They go to different countries where expats have relocated and talk to them about relocation and some facts about the country and where you live. It’s one of my new favs. Wow. I had heard rumors that the show wasn’t all “real”, but I had no idea it was that , as they say, “scripted”. One of my fellow American bloggers here in Paris was filmed for the show and is eagerly awaiting her broadcast. I wonder if she will admit to the same “massaging” after it airs? I DO love seeing the places in different cities, though, and I DID feel like I was on the show when I was picking out my apartment here in Paris. But no one offered me a massage…..
Hi There! Thanks for reading my blog and for your comment – ha! If they had offered a massage we might have said yes – ya need it living up 4 flights of stairs! I’m curious if the prices of real estate are semi-accurate. Some of the prices seem rather high for places like The Dominican Republic. Do they accurately reflect prices in Italy? Hi! Thanks for reading! Others have said the prices in their country weren’t accurate. Before we got here we saw an episode with another couple in Florence with a budget comparable to ours and the apartments they looked at seemed about spot on to me. Thanks for your response. Enjoy Florence! Just found your blob by following links about HHI having living and worked abroad for years I can’t say I was too shocked many things just seemed off . But thanks for showing some integrity where others seem desperate to get free publicity anyway they can get it. Thanks for the scoop on HHI. I have watched countless shows of this and always wondered how it really worked. Even though it never occurred to me that it was an reenactment, I did wonder why anyone would look at only three places before choosing. Especially when buying. Very interesting. I will still watch because I do like seeing the interiors and exteriors of other countries. I can understand you feeling uncomfortable with going through with it. It’s a tough call. It’s to bad they didn’t come up with a more honest format. We actually still watch it, too! You can tell which one they are going to “pick” because it’ll be the most empty (they rent movers and move all your stuff out for the shoot).